I bought this as a replacement for the KD-9 kick pad supplied with my Roland TD-25 kit, as the KD-9 had a tough life during 3 years from a heavy footed player. Most of my comments in this review are based on comparison with the KD-9, as it is likely that many buyers of the KD-10 will be doing what I did, ie replacing a worn out KD-9. Roland claim that the KD-10 is an improvement over the KD-9 in terms of stability and playing feel. In terms of stability, the KD-10 is somewhat heavier than the KD-9 and does feel more "planted" on the drum rug. However, as I never had any stability problems with the KD-9, I don't really notice any particular improvement here. All I can say is that stability is fine, and the overall construction and materials is good quality, typical of Roland V-Drums products. In terms of playability, I would say that there is marginally less rebound than the KD-9, and certainly the striking surface seems more solid and stiffer (less springy) than the KD-9. I'm happy with the playing feel. For those using an e-kit due to noise restrictions, note that the acoustic sound of the kick beater against the pad is not insignificant, and could easily disturb family members in an adjacent room (for example). In my case this isn't an issue, but for those for whom pad noise is an issue, best to try one in a local store before making up your mind. As the acoustic noise is quite significant, I have marked this product down one star. 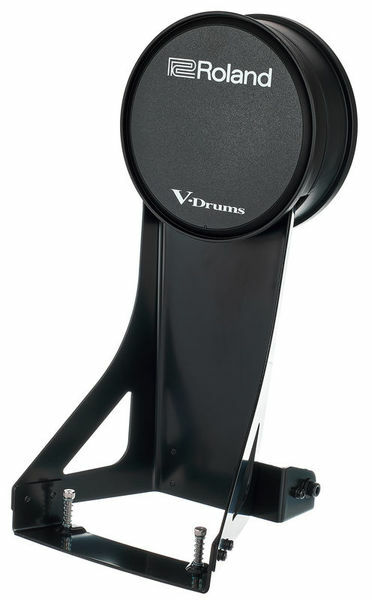 Build quality is typical Roland V-drums - good quality, good materials, and nicely packaged. No complaints in terms of construction. Overall, I think this is a good replacement for the KD-9 and would suit many e-kit users. Finally, in terms of the TD-25 module, I didn't need to make any pad/trigger settings changes in the module, I just plugged in the KD-10 and the pad worked and behaved as expected. Have the Roland KD-10 as a replacement for my old KD-8, which broke. I run it on a TD-6V module with which it works perfectly together. The pad is much sturdier and heavier than the old one and is therefore safe to use without slipping. It has a good sensitive approach. As far as I'm concerned - practice hobbies at home and play 1-2 gigs a year - perfectly and for an acceptable price. ID: 439672 © 1996–2019 Thomann GmbH Thomann loves you, because you rock!